Well, it’s that time of year again, where we begin rampant speculation on what the next Nintendo Classic Mini console will be. Based on console direction, it appears that the Nintendo 64 (N64) is primed to get the Classic Mini treatment, notwithstanding the possibility of a GameBoy version. Either would make retro Nintendo fans lose their minds but let’s assume it is the N64 this year, and speculate as to what games are likely to make the cut. The NES classic had 30 games and the SNES 21. I’m going to venture a guess and say the Nintendo 64 will get between 15 -20 games given the size of them and the relatively small N64 library when compared to the SNES (partly due to lack of third-party support in that era). One of the big selling points of the Classic Mini lineups is that the consoles have indeed been mini – literally fitting in the palm of your hand. You can expect the N64 classic mini to follow suit with the same design as the original but now in a compact version – lucky for us no big clunky power brick on the back of the console anymore! The SNES classic included two controllers of the same size as the originals, which was perfect for games like Super Mario Kart right out of the box. The concern with the N64’s controllers is that they are much bigger, and that the N64 had four controller ports. Offering all four controllers as part of the package would be highly appealing especially if we can get them in different colour variations, but that broaches the topic of how compact the package would be and what price tag it would command – I suspect significantly more than that of the SNES. But that’s a topic for another day. Today is all about the games, so let’s jump into it. I’m going to cover 17 games that I think belong on the Nintendo 64 Classic Mini. Note: These games are not listed in any particular order. Have you heard the old saying that in life, there are only two guarantees – death and taxes? Well, I’m going to add in another guarantee in the case of the N64 classic mini. I can guarantee you that Super Mario 64 will be included, and it will be a spotlight game. Ok, first I need to come clean here. Super Mario 64 was not my first N64 game, though it should have been. When I told my friends in middle school that I was going to buy an N64 and asked for game suggestions (Sega Genesis was my first ever console so I didn’t have a long history with Nintendo at the time), one friend talked about how hard Super Mario 64 was and seemed to be dissuading me from getting it. Unfortunately, those comments stuck in my head and I ended up buying Mario Kart 64 as my day one purchase. To be clear, I love Mario Kart 64 – it’s my second favourite in the series after Mario Kart 8. You’ll be happy to know though, that I rectified my mistake by buying Super Mario 64 a few months later. Ok, let’s get back on topic. Super Mario 64 pioneered the 3D open world platformer. To this day there are still speed-runners playing this game, modders who are doing wacky things like taking the assets and placing them in the world of Ocarina of Time, and more recently, players who have made dedicated YouTube videos showing you how to get Yoshi to fall off the castle at the end of the game. That’s how beloved this game is; it’s stood the test of time for over 20 years and will still be remembered fondly for many years to come. For anyone who never had the opportunity to play this game, I assure you that it is well worth your time, and the pure joy of spinning Bowser around by his tail is reason enough for me. A Link to the Past is still widely regarded by many as the best Legend of Zelda game to this day. There’s no doubt about its legacy, but when you have a long standing series with so many classics, it gets difficult to rank where exactly one title should sit among the others. As previously mentioned, the N64 was my first Nintendo console so I had never played A Link to the Past. I still vividly remember the commercials on TV for Ocarina of Time – I was captivated seeing the Great Deku Tree and Link running around a 3D world. I became aware of a special collector’s edition where the cartridge was painted in a gold colour, shortly before the game’s release. I had made it my mission to get the special collector’s edition. I used to buy a lot of my games from a local flea market but the vendor didn’t have any collector’s copies in stock. One evening, I called a local Zellers store and asked the sales rep if they had the collector’s copy – he said yes! I immediately got my dad to take me to the store and picked up a copy of the game. I was elated! One thing I didn’t realize was that all collector's editions had ‘Collector’s Edition’ written on the front of the game – mine did not. When I opened my copy, I was disappointed to see a grey cartridge. I immediately called the store again and they offered to let me return the game given the misinformation (although I don’t think you could easily return opened electronics even in those days). In my head, I wanted to return it but my heart wanted to play the game and so once I started playing, I ended up keeping my copy. Ocarina of Time was also Link’s first step into the 3D world and it was nothing less than spectacular. From the graphics to the music to the gameplay, everything was crisp and breathtaking. The story was compelling – an outsider who didn’t feel like he belonged, and his journey to become a legendary hero and save the land of Hyrule. Similar to Super Mario 64, Ocarina of Time has stood the test of time, and is most deserving of its place as one of the best Legend of Zelda games ever made. For anyone who owned the SNES classic and has played Star Fox 2, a game that was cancelled shortly after completion, can agree that cancellation was the right decision. Given that Star Fox 2’s release date was scheduled for 1996 - the year that the Nintendo 64 was releasing - it made sense to shelve that game and move development over to the N64 toolkit to bring fans of the series a true 3D Star Fox experience. Star Fox 64 is a reboot of the original Star Fox on the SNES, and is still regarded as one of the best in the series. Star Fox hasn’t had a lot of success on the last few Nintendo consoles, so having this game on the N64 classic mini would be a welcome addition. Where do I start with this one? This was my first N64 game. A game that my Mom dubbed as 'nothing special' graphically compared to games I had played on the Sega Genesis. It was special and still is to this day, for me anyway. I was playing Mushroom Cup two nights ago and it’s just as much fun today as it was back when I bought it in 1997. Mario Kart 64 is superior to its predecessor in every way. Similar to what Super Mario 64 did for platforming games, Mario Kart 64 did for go-kart racing games. Some of my favorite racing tracks are from this game and some tracks have since been remastered in the latest edition of Mario Kart 8. Mario Kart 64 truly kicked off the era of multiplayer social party games and those blue shells continue to strain friendships to this day. Time for another moment of truth – I had rented Super Smash Bros. one day and just wasn’t very impressed. I played a bit of the single player mode and a few multiplayer matches with friends but at the time felt that this was a game more suited for people who had siblings, or if you had a lot of people over to play with on a regular basis. I guess I didn’t find the whole setup of Nintendo characters “duking it out” that appealing, and so I didn't pick it up. Big mistake! You know that saying that you sometimes have to pay for your mistakes? Well I did, literally. I had to pay $20 to $30 over the original cost of the game back in 2015 just to have it as part of my collection, and on top of that, no box or manual, just the cartridge. No complaints though, it was worth it. I play the original Smash Bros. every so often with friends and we always have a great time. It’s funny to think that such a game might never have existed had Masahiro Sakurai (the series creator) and Satoru Iwata not come up with a working prototype to showcase to Nintendo. The game did not have Nintendo's approval prior to the prototype being made, and Shigeru Miyamoto himself had reservations about creating a game where iconic Nintendo characters were beating each other up. Thankfully, Sakurai and Iwata were able to convince Miyamoto and the higher ups at Nintendo to make this game, and it’s been nothing but successful for them since. The Smash Bros. series has such a strong following that it's regularly played on competitive circuits, and literally blew up the Nintendo-verse when the latest entry was announced for Switch earlier this year. The statement “Mario & friends serve up another ace!” could not have been truer. 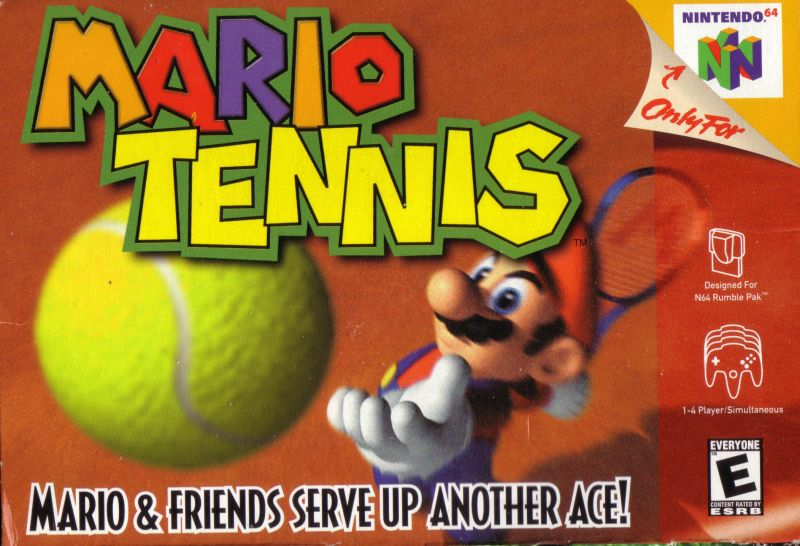 I love the Mario Tennis franchise because I’m a big tennis fan. I got into the sport during my teen years in high school, so I’ve watched tennis, and played it. I still remember my uncle buying me Mario Tennis 64 for my 16th birthday. My university friends and I had an N64 retro night during a long weekend a few weeks ago, and we played Smash 64 and other retro games, but guess which game we had the most fun with? Mario Tennis 64. The sheer competitiveness that surfaced as we were playing doubles matches was unreal. When Mario Tennis 64 first released, it was on the top games charts for almost a year and if it crops up on the N64 Classic Mini, you’ll see why. Before Mario Tennis, Nintendo’s first big jump into Mario–based sports titles was with Mario Golf. At first glance, it seemed odd to have a golf game with Mario but as Nintendo has shown in the past, they’re not afraid to try new things, and they know how to make fun and competitive games. I used to go to a lot of driving ranges and mini-golf courses with my dad and friends when I was younger, so this game really appealed to me. It didn’t hurt that the game was Mario-based either of course. Don’t let the title fool you into thinking this is a simple swing and put golf game. It's a well-made and tight golfing experience. Looking at the terrain ahead and deciding which golf club to use, keeping an eye on the direction of the wind – everything about this game screams attention to detail and challenges you to think about your shots strategically. The 1997/98 game of the year. Can I just stop there? Before Halo stormed onto the scene as the go-to first-person shooter, Goldeneye had set the standard for what a first-person shooter game should be. It probably didn’t hurt to have Pierce Brosnan as 007 as well. From the story mode to the iconic multiplayer mode, Goldeneye stole many hours from our lives and I don’t think any of us would change a thing about that. The licensing for this will throw up a few hurdles, but it would be a travesty if there's an N64 mini that doesn't feature Goldeneye 007. One of my all-time favourite Nintendo games, this unlikely bear and bird pairing has produced many joyful memories for Nintendo fans. Building on the sandbox gameplay style of Super Mario 64, Banjo- Kazooie sets you off on a journey to rescue Banjo’s sister from the wicked witch Gruntilda. From the quirky humour to the vibrant and lushes levels, Banjo-Kazooie remains one of the best 3D platformers to this day. Fingers crossed that by some miracle we'll one day get a new Banjo-Kazooie game on a Nintendo console, though I’ll settle for an HD remake of the original! The biggest hurdle for this game's inclusion is that, since Nintendo sold Rare to Microsoft, the rights for the franchise have rested with them. Fear not though, recent tweets from Xbox head Phil Spencer indicate that he is open to having Banjo-Kazooie appear in Smash Bros. for Switch, so there’s a chance something could be worked out to bring this classic title back for the N64 Classic Mini. I know some of you will say that the first Mario Party is not the best of the original trilogy, and you wouldn't necessarily be wrong there. But I loved the original Mario Party because it was the one that started it all. That said, having recently gone back and bought copies of Mario Party 2 and 3, I can see why fans would want one of the sequels given it improved on many aspects of the original. The reason why I feel Nintendo will stick with the first game though is because they did a similar thing with Donkey Kong Country on the SNES classic. Donkey Kong Country 2 is undoubtedly the best in the trilogy, but they chose to go with the one that started the franchise off and I feel Nintendo will follow suit with Mario Party. But hey, I’m not opposed to Nintendo including all three Mario Party titles – you have to dream big sometimes. I’ll argue that you don’t have to be a wrestling fan to enjoy this game. I’ve long since passed my wrestling phase, but back in the late 1990’s and early 2000’s, games like WCW vs. NWO World Tour, WCW/NWO Revenge, WrestleMania 2000 and WWF No Mercy were the kings of wrestling games. No one was better than THQ/AKI at making fun, easy to pick-up and play wrasslin' titles. The grappling system was simple and intuitive, along with very realistic graphics for its time. Much like Goldeneye, the issue with this game (or any of the aforementioned wrestling games) will be licensing issues and also that the WWF lost its battle with the World Wildlife Foundation soon after the release of No Mercy thus becoming the WWE (World Wrestling Entertainment). Fingers crossed that by some miracle this one somehow makes the cut because it’s more than deserving of a spot. Again, there’s no reason to doubt that this game will make an appearance on the N64 Classic Mini and because Nintendo retained the rights to DK in their divorce with Rare, there’s no issue with the latter company no longer being under the big N's umbrella. Donkey Kong 64 is definitely not the strongest title in the series. In fact, it probably ranks near the bottom, but there was still plenty of fun to be had, even with the overwhelming amount of collectibles. To be fair, this was Donkey Kong’s first foray into 3D, and hopefully Nintendo has learned some new things with the reinvention of games like Breath of the Wild and going back to the sandbox style of gameplay in Super Mario Odyssey. Here’s hoping we see a new 3D Donkey Kong adventure on Nintendo Switch soon! This game went through quite a few name iterations, first it was Zelda: Gaiden then Mask of Majora before landing on Majora’s Mask. It uses the same game engine and assets as Ocarina of Time, but this is a much darker and different game to its predecessor. Link is transported to an alternate universe called Termina where he discovers the terrifying reality that he only has three days to stop the moon from destroying the world. There are lot of new and interesting elements in this game such as the clock system, and how events are based on the time of day along with the unique ability to wear masks and transform Link into Dekus, Gorons and Zoras among others characters. I strongly debated between including Pokémon Snap and Pokémon Stadium. I chose to go with Pokémon Snap because we already had one fighter type game in Smash Bros. (Not to mention that Stadium isn't as good if you can't connect your GameBoy copy of Red or Blue - Ed). My initial plan with this game was to rent it and feel it out before purchasing, but I ended up beating the game within the 3 day rental limit and yes, we used to be able to rent video games locally in the 1990’s and early 2000’s. Pokémon Snap revolves around a photographer who traverses Pokémon Island taking pictures for Professor Oak. He then scores your pictures based on factors such as the size of the Pokémon, their pose, and if more than one Pokémon is in the picture. Given the recent success of Pokémon GO, a similar Pokémon Snap type game for mobile would be a great idea. Nintendo had some good sports titles during the N64 era with 1080° Snowboarding leading the pack. Players were given control of a snowboarder in one of six modes. The goal was to either be the fastest to the finish line or to collect the most number of points based on trick combinations. 1080° Snowboarding was perceived to be a leader among snowboarding titles at the time, and many of the great snowboarding games that followed borrowed elements from this game. Wave Race 64 is another great racing title that to this day is fun to play. Players race on jet skis through a variety of courses, along with a multiplayer mode of up to 2 players. Some have referred to this game as 'F-Zero on water'. Speaking of which, the water effects in this game were mind-blowing at the time. Paper Mario was the second Mario role-playing game following the immensely popular Super Mario RPG: Legend of the Seven Stars on the SNES - a joint collaboration between Nintendo and Squaresoft (now Square-Enix). Unfortunately, one of the downsides of Nintendo’s decision to go all cartridge based over the new CD-ROM technology was that they lost Squaresoft to Sony and as such, had to create their own formula for a Mario RPG. The game still followed a traditional turn-based format, and used a new paper-based visual style that generally received favorable reviews. This game and it's successor on the Gamecube are still regarded as the best games in the series, and fans long for a return to the true RPG setup that has been shunned somewhat in more recent titles. Given the much improved relationship between Nintendo and Square-Enix along with the recently successful collaboration of Nintendo and Ubisoft with Mario + Rabbids: Kingdom Battle, let’s hope that these two gaming giants can come together again to deliver another Super Mario RPG title on Switch! Now with the SNES classic, Nintendo gave us an Easter egg with the never-before-released Star Fox 2. For the N64 classic mini, it would be nice if Nintendo did something similar – maybe the DS version of Super Mario 64 where you could play as different characters, or some of the 64DD games that never released outside of Japan. The 64DD 'Master Quest' of Ocarina of Time for example, would be a pretty cool addition. There you have it, my take on 17 games that deserve to be on the Nintendo 64 Classic Mini. I would love to hear your thoughts and stories on which games you’d like to see, so fire away down in the comments! Vishaal has a background in engineering, advocating for users through design research and storytelling. The Nintendo 64 was his first Nintendo console and he’s been a Nintendo kid at heart ever since. His favorite Nintendo game is Super Mario Galaxy 2.